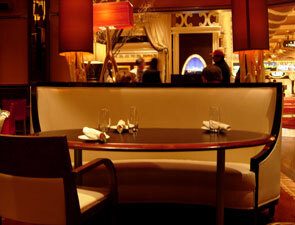 Wynn Las Vegas, the name is synonymous with Vegas and over the top elegance. The $2.7 billion dollar resort was opened with much fanfare and anticipation in April 2005. Although there's approximately 111,000 square feet of casino in the resort, there's also a myriad array of other entertainment options, including: an 18-hole golf course, an onsite Ferrari/Maserati dealership (if you hit that multi-million dollar slots), and several fine dining and casual restaurants. Corsa Cucina fits nicely between the signature formal restaurant, Alex, and the informal Terrace Point Cafe (an all day dining option). Stratta has a more elegant atmosphere than the casual cafe, and boasts exceptional gastronomic creations while still allowing you to forego that extra stress of having to change into your fine dining attire. In many respects, Stratta is the perfect restaurant for a fine, relaxing meal before an evening at the gaming tables. If you've ever had a hard time locating a restaurant amid the lights and chimes of a Vegas casino, don't worry, Stratta's large, backlit, signature sign is easy to spot. During the day, velvet ropes close off the bar area, but at night you can go right in from the casino. From the entryway, you're at the curvilinear corner of the L-shaped restaurant. 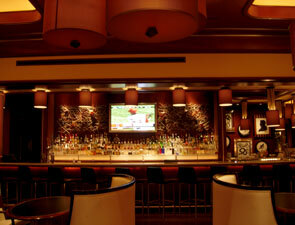 The bar and lounge area are to the left and the more formal restaurant with the open kitchen is to the right.